I like usal the misal way! The crunchy onion, crispy sev, and tart tomatoes, and the yoghurt, add the perfect texture to this healthy dish. I sprouted matki and mung last week. The matki was cooked, similar you your usal (with some goda masala), with green beans, while the mung didn't sprout (aged seed I guess) and was steamed and served like you have served these. Pel, do you know something I don't? Oh wait, I do sprout sweet potatoes and then plant them in window boxes. Much cheaper than paying for sweet potato vines at the garden center. They're a wonderful chartreuse color. This may require a shopping trip! Hey, you two! Anita and Pel! Go put notes on each other's photos. No chitchat allowed here. Kitt, sprouts are a powerhouse and very healthy. Try these! They are really easy to make. How do you sprout sweet potatoes? I thought they last forever. I had sweet potatoes in my basement for over a year before I used them. No sprouts. They didn't even rot! They were gorgeous in color and the flavor did not seem to have changed. so what u gonna post for GYO???? ;) I am all ears and eyes!!! 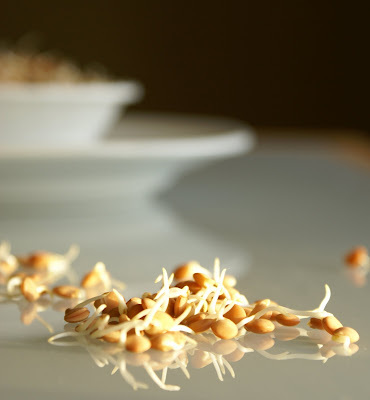 i love sporouts and usli is my all time fv dish to make using any sprouts. i like to cook or rather stri fry for a while (i like it better than uncooked ones) with very few ingredients. lovely pics manisha. The masoor dal sold commonly in the stores is the split orange lentil, and this will not sprout. You have to ask for whole masoor or chilkawali masoor, or as we used to call it in our childhood, bedbug dal. Thanks for the recipe. I am going to try this. Never tried to sprout masoor. Will give it a try...I am sure it is very very tasty. See..I love all your recipes..thats why I keep pestering you for recipes :). Waiting for your GYO entry. Pel, who knew that sprouts would be considered being agriculturally savvy? My yard is a harsh environment, remember? Sia, you mean I have to post something for GYO? I think I might be out of time. Subhorup, when you use the word dal, it means that the dried beans have been hulled and split. Anything that is split will not sprout. You will notice that I have not used the word dal at all. 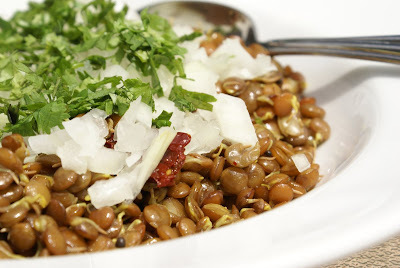 I have instead called it whole masoor or whole lentils or just masoor. Whole lentils are easily available in regular grocery stores as well. And, please, no talk of bed bugs on this blog! Priya, back to childhood lessons: just because they call you something, it does not make you that. Same with masoor. Besides, this is not dal. Just sprout the darned thing and eat it. It is healthy. Shilpa, it is so much easier than green beans or matki. Notice that this recipe is also very simple. It is just phodni + sprouts. GYO? I have no idea what you are talking about. And, in these parts (N India), dal=lentil, in whatever form it may be, split, or not, skinned, or not; usually qualified by adding sabut for whole, chilka for "with skin" (un-hulled), and dhuli for skinned - no ambiguity. bee's GYO? it's jai's GYO. he's going to do the roundup. Anita, too much tequila? Again? The notes *are* on Flickr, sweetie, which is where I directed you. Bee, he is? Is he going to start doing memes also now? Did he leave a comment on every entry? It's part of the hosting and round-up duties as I am sure he knows. I agree with you Manisha. Whenever it is mentioned as dal, I take it as split one....Anita's comment is a total eye opener. I did not know why many people on my blog kept asking if I meant whole or split when I mentioned moong or masoor. It never made sense to me when I read whole masoor dal :(. Yup, misal it is for me :). With extra mirchi and tikhat sev please :-D.
My other favorite is kulith usal (not sprouted, just cooked) and the saar made from the kulith broth, with some dahi mixed and a jeera-hing phodni. Total bliss. And usals work so well as a sandwich stuffing!! The sprouts photo has been clicked beautifully! Not too much - just a little, every now and then. Now that my bar is re-stocked..hic. And how do you address mung chilka which is split but not hulled? That is dal, and then hulled one is also dal? Very confusing...ambiguous...unless you add another word...do you? Shilpa, well thank God there is at least one person who knows what I am talking about! Musy, when are you posting recipes for all those yummies? Soon, I hope! Padma, thank you! They were basking in the glow of the setting sun. Anita, we don't address them at all. These were never in our list of staples. We only ever had whole green moog and moogachi dal. No in-betweens. I was introduced to the in-betweens at a Punjabi friend's house - in khichadi laced with major amounts of ghee. In-betweens...hee hee. I remember I asked someone about this once...because M. Jaffrey would refer to "whole moong" and "moong dhal" or "moong dhal with skins" and then I visited some blogs where they were ALL dhal, and some not. Confusing. India. Gotta love it.